BELGIUM: The wind industry is evolving in two main directions: new, and bigger turbines including new technologies and new, more extreme markets. These trends mean wind turbines and its components need to be designed, manufactured and tested in all conditions to meet the required performance and reliability during their lifetime. Notably, wind turbines are increasingly being confronted with freezing conditions that can be found in many regions of the world. Sometimes wind turbines in those climates need to be disconnected and restarted. It is, therefore, essential to test components for a cold restart. Transformers in multi-megawatt wind turbines are critical components just like the gearbox, generator or convertor. The transformer is one of the main components that first sees if electric power flowing. During testing, the transformer can be exposed to the extreme temperatures and correlating pressure and thermo-mechanical stresses of arctic conditions. 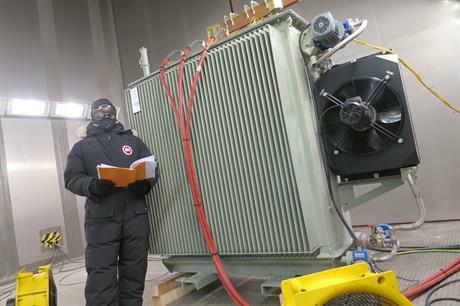 The programme can investigate whether transformers be connected with high-voltage cables in those conditions and discover if the electric insulation system and materials are suited. Finally it can show at what rate the power can be increased and whether the wind turbine can be ramped up to full-load within four hours. In order to get detailed answers and proven reliability, a transformer is put in these harsh conditions down to -40C in climate chambers, like the one at OWI-Lab in Antwerp. During a low temperature test campaign a delegation attending Windpower Monthly's Optimising Wind Farms In Cold Climates forum had the opportunity to visit the laboratory and test centre. The 20-strong delegation was made up of representatives from manufacturers, owner-operators and service providers. They had the opportunity to experience low temperatures first-hand by entering the climatic chamber and witness the effect of low temperatures and icing on key components. Next to the wind turbine transformer, coating samples and a small wind turbine blade were also set-up for testing. The visit was complemented by a presentation from Enercon on their technology as well as an explanation from OWI-Lab about their activities in relation to cold climate issues. The climate chamber can also simulate hot climates up to +60C, the maximum temperatures in transformers and other components can be simulated and tested at full load. Find out more about Windpower Monthly events here.